The future of once-mighty Research in Motion rests on its new Blackberry 10 operating system -- a fact RIM played up Wednesday by changing its name to BlackBerry. The surprise move came as the company kicked off a series of around-the-world events unveiling BlackBerry 10, along with the first two devices to run on the new platform. The Z10, which features an all-touch keyboard, is rolling out over the next several weeks. It hits the United Kingdom on Thursday, Canada on February 5, the United Arab Emirates on February 10. The United States won't see the Z10 until sometime in March. The Z10 will cost about C$150 on a 3-year contract in Canada, but pricing wasn't announced for other countries. The Q10, which features a classic BlackBerry tactile keyboard, could come out in April, but that timeframe is still up in the air. BlackBerry said it is in discussions with carriers. BlackBerry 10 is meant to be the linchpin of RIM's (RIMM) turnaround, and it's been a long time coming: The software was originally slated for release in early 2012. That was pushed to late 2012, and pushed again to the first quarter of 2013. It was damning news for RIM, whose market share in the U.S. has plummeted. 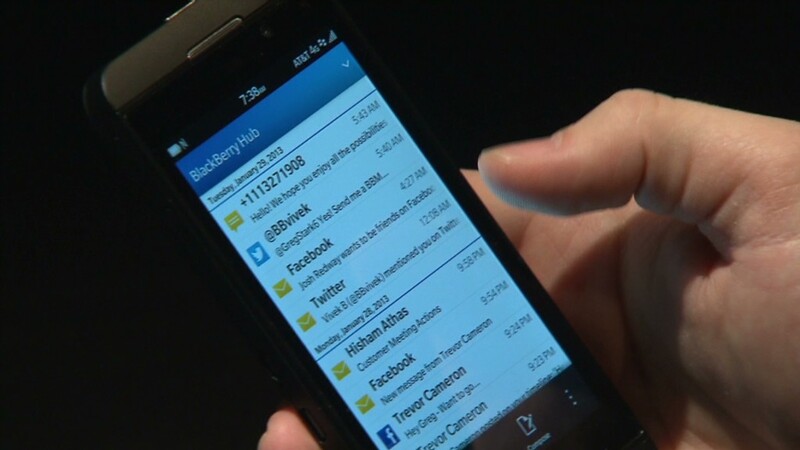 Now, RIM has to prove BlackBerry 10 was worth the long wait. Name change: Before unveiling the software on Wednesday, CEO Thorsten Heins talked about the company's major changes over the past year. "We have redefined ourselves inside and out," Heins said. "RIM becomes BlackBerry! It is one brand, it is one promise." The audience murmured loudly after the name-change announcement. Heins discussed the company's struggles, referring to them as a "journey of transformation," after antics that included a man cutting off his ponytail in the middle of the audience. "CrackBerry Kevin," an avid fan, had pledged not to cut his hair until BlackBerry 10 launched. Singer Alicia Keys appeared later in the presentation, to prolonged applause. She'll become Blackberry's creative director (a title Lady Gaga holds at Polaroid and will.i.am has at Intel). Blackberry 10 features and apps: After Heins acknowledged RIM's troubled past, he quickly moved to its future. BlackBerry 10 will run on a smaller number of devices and include essential smartphone features like a much-improved camera, a modern Web browser and social-networking integration. BlackBerry 10 will launch with 70,000 apps, which RIM executives said is "by far" the most for a first-generation platform. RIM called out Skype, Amazon (AMZN) Kindle, Angry Birds, Box and more as app highlights. Some popular apps are missing at launch, though, including Netflix (NFLX), Spotify, Pandora (P) and Google (GOOG) Maps. Heins started with the consumer-friendly features. The BlackBerry Hub is a catchall for communications like email, texts, and Facebook. (FB) BlackBerry Flow lets users toggle between apps by swiping, rather than using the home button. Separating work and play: But RIM is still focusing on its bread and butter, the workplace. The software lets users access e-mail with one swipe from any app, and shift between personal and corporate modes. Executives pushed hard Wednesday on that work/life divide, the foundation for a feature called BlackBerry Balance. It lets users keep their corporate and personal information completely separate. Users can toggle between the two modes, but they're not able to copy a message, for example, from the corporate mode and paste it into the personal. Balance is clearly a bid to make corporate folks happy. A major part of BlackBerry's decline comes from its losses in the enterprise market. Companies have been increasingly willing to let employees work on phones they choose -- a phenomenon known as Bring Your Own Device -- and they're overwhelmingly selecting hardware from rivals. Meanwhile, BlackBerry competitors like Apple (AAPL), Google (GOOG) and Microsoft (MSFT) have worked hard to improve their security and e-mail delivery capabilities. As a result, corporate IT departments have opened their once-restrictive gates to non-BlackBerry devices. Other BlackBerry 10 features include BBM video calling, which also lets users share screens with each other, and a Story Maker app that automatically stitches photos into a video clip and sets them to music.